I've told y'all before about how well my cousin Brenda preserves things. She even preserves beans! I don't have a pressure canner, so that's a little out of my league. However, I can easily do preserves, jellies and butters. On her urging I purchased the Ball Blue Book so I wouldn't poison anyone, and I have to tell you this book has been so helpful. Brenda said Peach Butter is really easy to make and since I had a few peaches from last week's $.58/lb sale at Food Depot, I decided to try my hand at it today. Brenda said she adds cinnamon and so that's what I did. I also added a small dash of nutmeg, just because...The original recipe calls for 4 to 4-1/2 pounds of peaches. I only had one pound of peaches, approximately 6 peaches. I blanched them in boiling water and then dunked them into an ice bath to remove the skins. Then cut them into quarters to remove the pit and popped them into the pan. This small amount made two half pint jars. I didn't put these into a water bath since it was just this small amount. I placed them into the fridge. We already finished off one of the jars and it's only been one day! It's pretty tasty! Place the peaches into a pot with 1/4 cup water, bring to a boil and then lower to simmer until the peaches are very soft. Place them into the food processor and puree. Place the puree back into the pot and add sugar, cinnamon and nutmeg. Bring to a boil and then lower to simmer, stirring frequently to avoid sticking. Cook mixture until thick enough to round up on a spoon. Ladle into clean jars, top with lids and rings and store in the fridge. 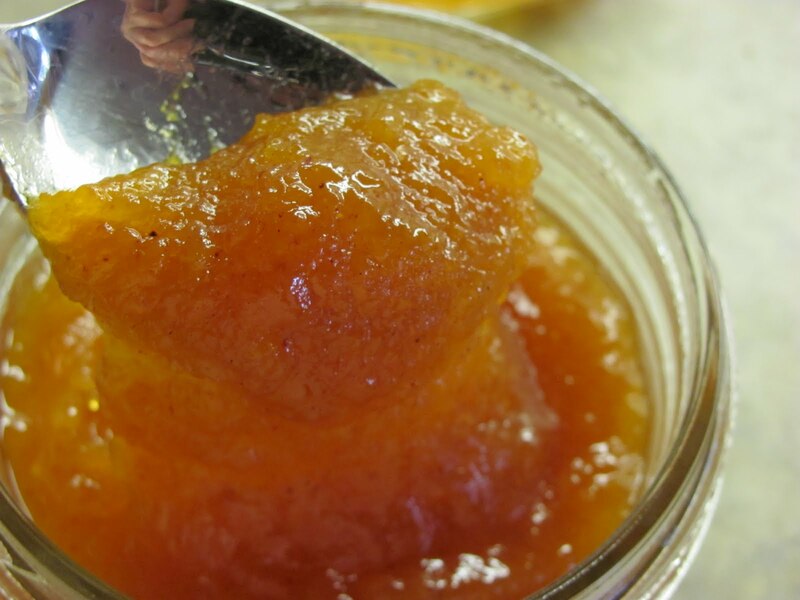 If you are preparing more peaches and want to preserve them for shelf stability. 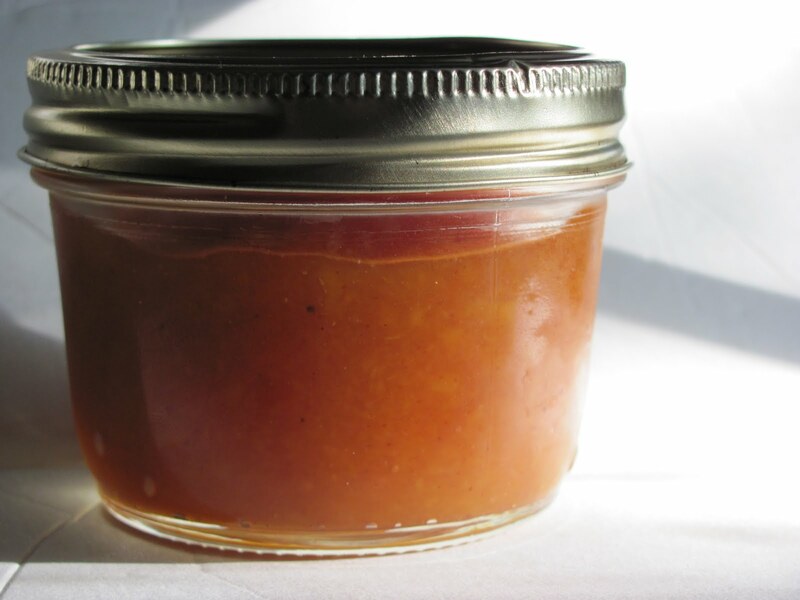 Make sure you have sterilized, hot jars to ladle the peach butter into. Leave 1/4" head space. Remove the air bubbles. Add the lids and rings. Then you're ready to process 10 minutes in a boiling water bath. That's it! Super easy and Brenda was totally right! It is so GOOD! This looks really good!!! Do you think you could just freeze it instead for later use? Looks good and sounds so easy! I made freezer blackberry jam the last years, this looks like another good one to try! I can tons of peaches every year but have never heard of peach butter. It sure looked yummy! What would you use it on? I also did peach butter and was amazed at the yield for just a few peaches. Good job. I love making and eating applebutter (the house always smells amazing when I do) but I haven't tried Peach butter. I want to though after seeing yours, now I just need to find some peaches. Peach butter sounds special. As a fan of peaches, I know I would love it. Thanks for linking it to My Meatless Mondays. Oh that looks heavenly!! I like that you only made a small amount - makes it more do able for us canning newbies!! thanks for linking to the hearth'nsoul blog hop! Thanks for linking up with the Hearth and Soul blog hop. How cute that your cousin would advise you to buy the book to keep you from poisoning anyone! I wish I had had some guidance when I was learning to can! Fruit butters are one of my favorite, and I think I'm one of the last people in the US to have peaches ripen (not YET), so I could still make this recipe.